TomTom has updated its iPhone app with a number of new features, including live traffic updates, local Google searches and better overall integration with the iPhone and the iPod functions on the device. TomTom's app update promises users "optimal routing and an even more intuitive navigation experience" and users can buy the latest version 1.3 of the TomTom app on the App Store as of today. "TomTom continues to expand its offering of premier navigation services and features to a growing base of TomTom app for iPhone users," said Tom Murray, vice president of market development. "Among the many enhancements in the latest version of the app, TomTom's comprehensive traffic offering gives users dynamic, real-time information that helps them avoid traffic delays and find the fastest routes. It makes the TomTom app for iPhone even more useful in our daily lives." Your iPhone will receive TomTom Traffic updates every three minutes, giving you real-time traffic speed and incident reports. If you don't want them (ie if the road ahead is clear) then simply turn them off. 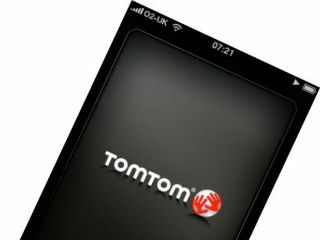 Note, however, that you will still have to pay extra to get access to TomTom HD Traffic, which you can either purchase online or via the app itself - TomTom Traffic for iPhone users is available via in-app purchase for an additional £0.59/£4.99/£11.49/£37.99 per day/month/quarter/year respectively. Local Search powered by Google - The TomTom app for iPhone now provides a countless number of points of interest at the user's fingertips. Users can tap into the latest local Google listings from within the TomTom app to locate and route to anything from restaurants to flower shops. Pinch and zoom - Integrating one of the iPhone's most popular features, the latest version of the TomTom app allows users to "pinch and zoom" for a more detailed view of the navigation map. Automatic day/night mode - For a safer drive, the TomTom app now also calculates local sunrise and sunset times to automatically adjust the screen brightness while driving. Music fading - This music fading feature ensures that you never miss a navigation instruction while listening to music on your iPhone. The music volume decreases during turn-by-turn instructions and then increases when instructions are complete. Add to my TomTom feature - Save locations from other iPhone apps and Web browsers to your TomTom app.